Posted on Sun, Oct 23, 2011 : 1:41 a.m. There is no question beer is seasonal. The herd tends to migrate toward dark lagers and strong ales when temperatures start to drop. As the summer turns to fall, the unique profile of a Rauchbier can deliver a rare experience for those willing to venture down the rabbit hole of craft beer. A rare experience for those willing to venture down the rabbit hole of craft beer. Description: The pour releases a smoky campfire aroma with a faint bacon quality that remains evident throughout the session. A burnt white head quickly settles to a thick film atop a coffee body with amber accents when held to light. The palate matches the nose profile with additions of char and leather, which offers an unexpected complexity. Sweet malt, dried dates, round out the dry finish tempering the departure. I anticipate this will be a love-hate relationship for most but unquestionably worth the effort if only for the experience. Conclusion: There is something about smoky flavor that is deeply satisfying, something that is not so easy to explain logically. Let me explain. 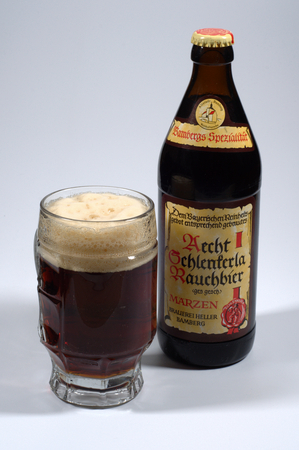 The term “Rauchbier” means smoked beer in German. The smoky quality comes from an ancient brewing process when open flames had to be used to dry the malt. New drying methods became available in the 1700s, but some purists never gave up on the old world style. The American craft beer scene has been tinkering with this oddity in recent years. Alaskan Smoked Porter from Alaskan Brewing Co. and Fore Stout from Michigan’s very own Dark Horse Brewery are both epic efforts. But the godfather of smoked beer is Aecht Schlenkerla brewed by Heller-Brau in the Franconia region of Bavaria. Local beach wood is used to fuel the smoke-houses in which the malt is dried. The beer is then stored in sandstone caves, where it matures for several months before generally available to loyal fanatics. The resulting beer is dark brown, with a quietly intense smokiness backed by sweet malt and dry finish. Many agree this unique offering is most appealing when one is nestled in an oversized chair, warmed by an open hearth on a wintery night. Others suggest the smoky flavor lends itself as the perfect pairing for barbeque, cured meats, or grilled fish. Under the stars on a cool summer night roasting marshmallows on an open fire also seems to be a fitting venue. Regardless the scenario, Aecht Schlenkerla is assertive and unique but entirely fascinating and surprisingly delicious. Tue, Nov 15, 2011 : 5:10 p.m.
A subtlety of the German language: it's &quot;_smoke_ beer,&quot; not &quot;_smoked_ beer.&quot; &quot;Smoked beer&quot; would be &quot;Geräuchertes Bier&quot; in German, implying that the beer itself is smoked. &quot;Rauchbier&quot; implies smoke-flavored beer, with the flavor coming from &quot;Rauchmalz&quot; (&quot;smoke malt&quot; - whey they don't call it &quot;Geräuchertes Malz&quot; is best answered by a brewer or maltster from Bamberg!). Just one of those peculiarities when going from one language to the other - and back again. Schlenkerla is not the only Rauchbier from the region. Another Bamberg brewer, Spezial, is known for its more subtle Rauchbier, and there are others nearby - Kundmüller, Hartmann, Hönig, Rittmayer - that make some wonderful Rauchbiers, and one small specialist brewer, Gänstaller-Bräu, makes Affumicator, a Rauchbock of impressive depth and complexity. Prost!